Our hearts go out to those who are injured or who have lost loved ones and friends as a result of the shocking carnage that occurred in New Zealand yesterday. May Allah s.w.t. grant strength to their families and a high status in Jenna (Heaven) for those killed while attending their prayers. This tragedy that has occurred is not unexpected - as has been highlighted by Waleed Aly from the Project. Extremism of all forms is rife in the world today, fuelled by misinformation and a social media hungry for sensationalism. It exists in many communities - whether they be Buddhist, Hindu, Christian or Muslim as well as in non-religious communities. Extremism can only lead to tragedy, loss of human dignity and respect. 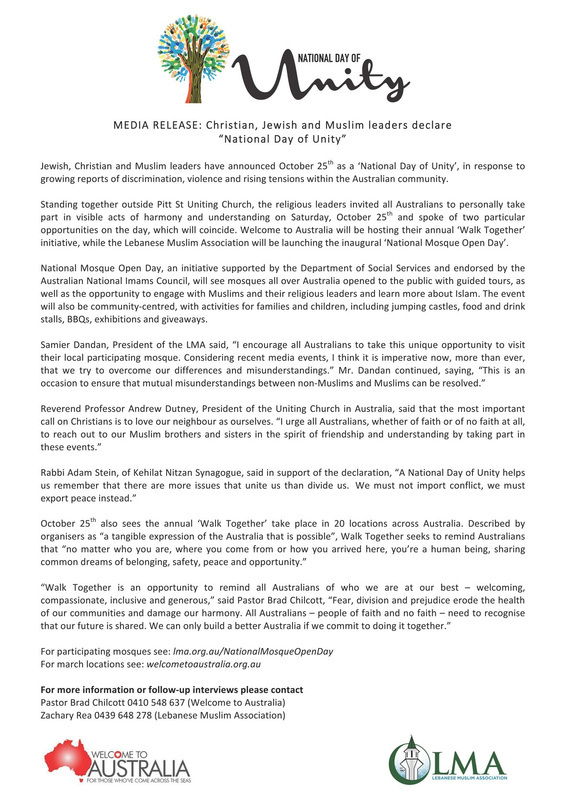 We need our leaders - within our Muslim community and amongst Australia's politicians and community leaders, to take this opportunity to stand together against all forms of extremism. Whether it is victimisation of refugees and their ongoing torturous punishment of indefinite detention, or hate speech that exists in the regular and social media, or lack of compassion for the less fortunate, or lack of responsibility for the actions of our own community members - we need to return to the principles that underlie every religion and especially Islam, those principles that are ethical, just and moral. Those same principles that lie at the heart of the concept of humanity. This tragedy must also be seen as a wake up call to policy makers and government, of the dangers of violent online gaming and uncontrolled internet use. We hope and pray that we will all stand together against Extremism, look honestly at our own actions and statements in order to bring back civility and respect, and act to protect our children and our society from all forms of hate. our love and prayers to the victims and their families as well as all of Barcelona. Killing of innocent people has no place in Islam and is fundamentally opposite to the unanimous teachings of Islam. have no respect for humanity nor faith. We send our thoughts, love and prayers to all those affected. AMWA condemns the devastating and callous attack that occurred in Manchester at the Ariana Grande Concert on 22nd May 2017. We extend our sincere condolences to the victims of this horrific attack and keep all those affected in our thoughts and prayers. Islam is a religion of peace and well being and according to the Quran, one of the greatest sins is to kill an innocent human being. Anyone who respects the word of God would not do harm to even one individual, let alone numerous. AMWA's thoughts and prayers are with those who have suffered due to the horrific massacre at the Pulse nightclub over the weekend. There is no excuse for violence to be inflicted on those who choose to live a different lifestyle or who hold different points of view and particularly on those who have suffered from homophobia. We are living in an increasingly divided world, where 'leaders' intentionally seek to drive communities against each other for their own purposes.This is not the way of the Prophet Muhammad s.a.w. or part of the teachings of the religion of Islam, or the revelation from our Creator in the beautiful form of the Quran. It is important that each one of us individually have the courage to stand against those who allow anger to overtake their sensibilities, using hateful speech, aggression and threatened or real violence. If the reports stating that Omar Mateen was also part of the gay community, then it is pertinent to reflect on the increasing number of young men under the age of 30, who struggle with social issues, becoming depressed and turning to drugs, radicalism, violence or suicide as part of their misery. Our leaders must address this increasing trend amongst the younger generation. ​On behalf of the Australian Muslim Women's Association we would like to express our extreme sadness at the senseless murder of the NSW Police officer, Curtis Cheng, and the subsequent death of a young boy. Our thoughts are with the families of the deceased and the injured. We appreciate the comments of Police Commissioner Scipione, the Premier Mike Baird and the Prime Minister Malcolm Turnbull in calling for a united front in responding to this crisis. 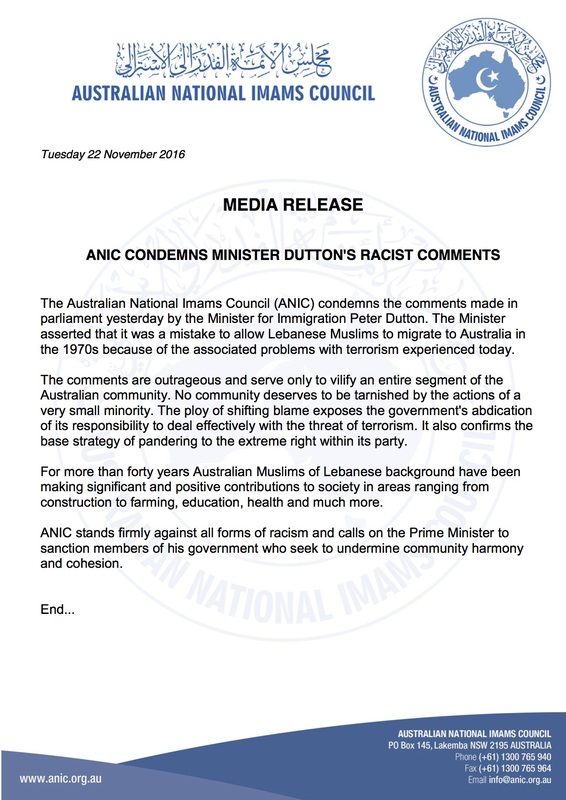 The majority of the Muslim community is willing to co-operate in a full and fair investigation of this tragedy and has an unequivocal opposition to any violence inflicted on our soil. We trust that the investigation into this matter will be thorough and that all parties will work together to identify how such a young man could so tragically take the shocking decision to kill a representative of the police force. 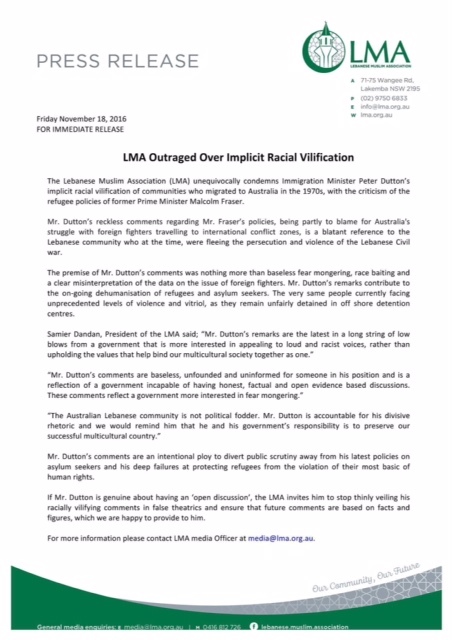 The Australian Muslim Women's Association calls on its fellow Australians to work with us in ensuring that messages of hate and violence should be replaced with messages of mutual respect and understanding - as enshrined in the teachings of Islam - in dealing with the challenges affecting our global community today. In the past 5 days there have been two major tragedies that have dominated Australian television screens - the Sydney Siege and the slaughter of children in Pakistan. There are many more that have not made it to the news room. Most of them involve anger, hate, revenge and violence. They stem most often from injustice, from corruption and from the powerful oppressing the weak. It is easy at times like this to fall into despair, and to lose hope. Those who believe never lose hope. The Quran advises us "Verily, Allah will not change the condition of a people until they change what is in themselves" (13:11) Although this is a well known verse, it is not always clear how this should happen. The most important driver of our actions and therefore the state of our mind is our heart. If our hearts are full of greed, holding onto resentment and being selfish, we cannot bring much good to those around us, or help bring about change for the better. The grief, the caring and the compassion that has been shown by so many over the past few days helps remind us of what is truly important in our lives - our families, the blessings that we have been given and caring for others. The tragedies that we have witnessed help us to recognise that anger, hate and injustice do not bring any benefit either to ourselves or to society as a whole. It is possible for individuals to bring about the change that the Quran refers to - each of us in our own way, by recognising and rejecting the anger and resentment, the greed and the selfishness that clog up our hearts. When we fill our hearts with care for others, with thankfulness to our Creator for what we have and a willingness to do good for those that we interact with, then and only then will society begin to change for the better. Praying for all of us to try and make the world a better place.